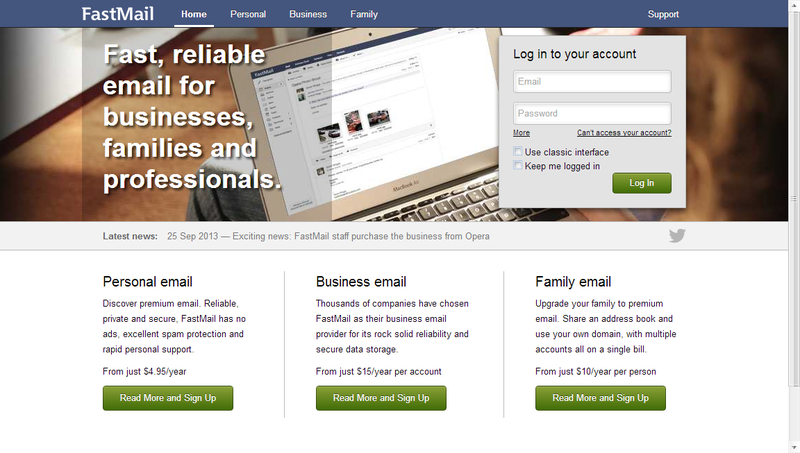 Paid-for email service FastMail is returning to independence after its staff purchased the company back from Opera in an undisclosed deal announced today. Web-browser-maker Opera acquired the company back in 2010. Why has Opera sold you? Are you in trouble? Not at all. Opera has undergone an internal change of strategic direction and an email service no longer fits within their long term vision. With Opera’s investment in development and infrastructure over the last 3 years, FastMail has continued to increase its rate of growth and profitability. We came to the mutual conclusion that FastMail’s future would be better served as a separate company. FastMail is a paid-for service, unlike Gmail, Yahoo, Outlook.com and others. Personal accounts cost upwards of $4.95 per year and business accounts are priced from $15/year per user. There is also a ‘family’ option, priced at $10/year per person. We’ve reached out to Opera for a statement from its side of things. We like FastMail a lot, and will keep working with them as a partner, much like we do with many other companies. Email is not such an integral part of the strategy as it was in 2010, and a company like Opera always must consider if the best solution is to own- and run it’s own services, or to not own, but partner with others to deliver them. In this case we agreed that the best way to move forward was to let FastMail’s employees buy the company back, and continue working together as partners.